The need is great; the moment is now! 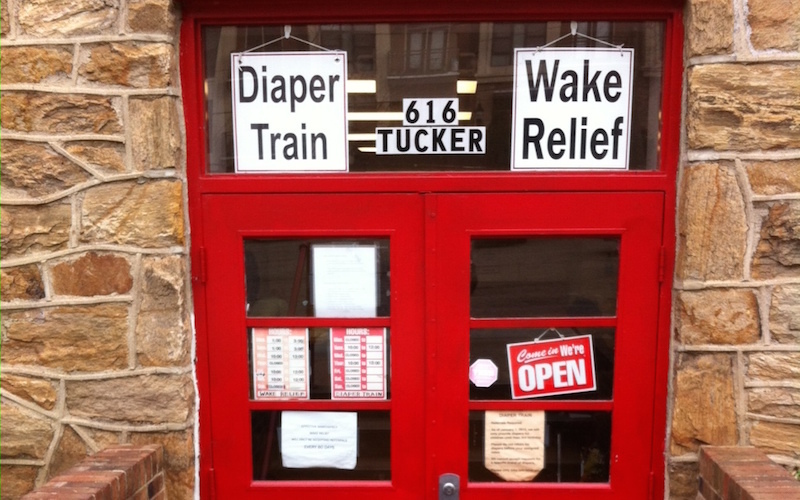 Climb aboard The Diaper Train! On Tuesday and Thursday mornings throughout the year, moms and their little ones (and occasionally dads and grandparents) form a line outside the bright red basement doors of Saint Savior’s Center in downtown Raleigh, awaiting entry to The Diaper Train, where they’ll be given a free 10-day to 2-week supply of disposable diapers and wipes. Brought to life in 2011 by Allene Adams and Cameron Ellerbe, Wake County’s first diaper bank and program of Saint Savior’s Center was born after the two Christ Episcopal Church members learned of a nationwide need for disposable diapers that hit close to home, right here in Raleigh. Each month, Diaper Train volunteers or one of our 12 partner agencies provide 55,000 diapers to 1,000 children aged 2 and under who have been referred to us by one of the 4 approved referring agencies. Last year we distributed 658,000 diapers, and since 2011, our grand total distribution is just over 1.4 million diapers placed into the hands of low-income families. Costing as much as $100 per month per child, diapers are a necessity – along with food, clothing, and shelter – that 1 out of 3 families struggles to purchase. Even though public assistance programs and food stamps are available to these families, diapers are not covered. Diaper insecurity joins both food insecurity and unstable housing as a leading cause of maternal stress and depression, according to a 2013 national study conducted by Yale University and the National Diaper Network. When faced with diaper need, many parents choose to go without food or gas or forgo paying rent and other bills. Since most licensed day care centers require parents to provide a continuous supply of disposable diapers, those who cannot end up missing work or school to stay at home with their child, and this fuels a vicious cycle: No day care, no work. No work, no income. No income, no economic stability. Many moms resort to making trade-offs that can endanger their child’s health, like trying to make one diaper last all day, which often results in urinary tract infections and diaper dermatitis, a painful and persistent rash. An unhappy baby makes for an unhappy mom. It’s important not to downplay how this adds up to high levels of stress, depression, and anxiety for the mom. The Yale study found that mental health issues were actually more pronounced in mothers who had no access to a reliable diaper supply than for those who reported food insecurity. The mothers interviewed explained that they felt like failures when they couldn’t communicate their love to their children by keeping them clean, dry, and comfortable. An unhappy mom makes for an unhappy baby. Not surprisingly, maternal depression impacts a child’s achievement in school and can also contribute to child abuse. Yet an act as seemingly small as providing diapers on a regular basis has a huge, positive ripple effect. Be a part of the change! The moment is now! Won’t you climb aboard? The Diaper Train continues to grow by leaps and bounds! To keep us chugging along, we count on local churches, businesses, schools, civic organizations, and individuals like you to keep us fueled up and ready to roll. Or do you prefer to let your fingers do the talking? Do you have a blog? Link it to our website!